eBay vintage clothing models are by far the funkiest models in the world. But lets face it, their faces never get the credit they deserve. Until now. I declare a headwear war. Click on the links, view their auctions, peruse their poses and then vote for your favorite below – poll closes on Friday October 17. 1. shirtswithballs’ Professor Polyester is the master of mesh and Miss B. is the queen of the vikings. 2. All the models at the_black_barn encourage us to remember the 5th of November. 3. refreshmint’s Evan thinks t-shirts are acceptable attire in extremely cold climates. 4. 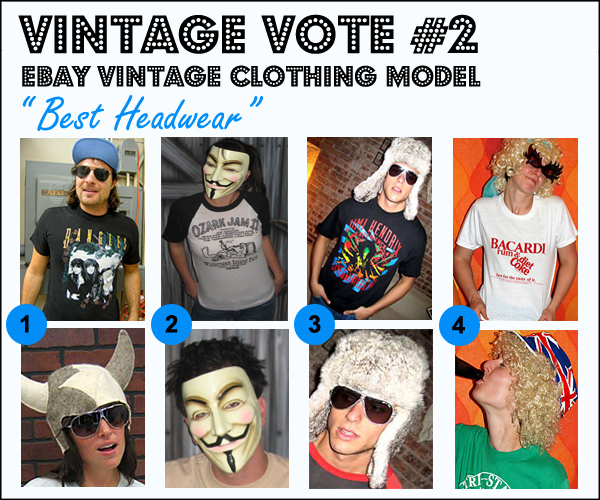 All the models over at vintagevantage have a party on their heads and everyone is invited.